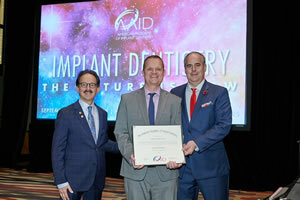 All-on-4 Dentist Dr. Matt Walton receiving his Associate Fellow from the American Academy of Implant Dentistry. Visit the dental implants page for more information and videos about the benefits of implant retained dentures and fixed implant supported hybrid bridges including preventing jaw bone loss. Also find the average costs to retain your dentures with implants and costs of fixed implant supported hybrid bridges including the All-on-4. Our patients tell us that this procedure has drastically improved their overall quality of life. A deposit is due when scheduling examination to reserve appointment. 3D CT scan (and any other x-rays as necessary) and complete review of mouth (teeth, gums, jaw bone, bite, etc).